The West Highland Way is Scotland’s first official Long Distance Route and runs near 100 miles from Milngavie to Fort William. It was nicknamed the 'Way Way' by a trio from Fife who set off to walk it in the year of the Millennium. This is not a guidebook but an account of their experiences, the highs and lows which any challenge presents of their marvellous, surprising, amusing and weird memories. They met many hundreds of people along the way but, naturally, those they recall were the more eccentric. Although the trio never managed another bigger trip together they realize how lucky, and wise, they had been to grab the chance when it came. There is remarkably pleasant rural walking at the start to reach the Highlands at Loch Lomond, fine woodland on its banks and later, the contrast of lonely, empty miles across Rannoch Moor, the Devil’s Staircase and the great pass of the Lairig Mor to finish. Encounters with other people are an important part of Long Distance Routes. Anyone who has walked the Way Way (or is planning to do so) will enjoy this story, bringing back plenty of similar memories of people and places, adventures and misadventures. The illustrations too give a wonderful idea of the rich variety of country traversed and well capture the atmosphere of this walk through Scotland’s fine landscapes. This informative book will be of immense appeal to anyone with a love of the outdoors and walking, the natural world and who enjoys a good read. 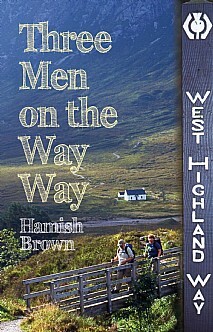 It is sure to appeal to any Hamish Brown fan.